Today’s interview is with Mandy Peterson also known as “Mystic Mandy.” Mandy is a Psychic Visionary, EFT Practitioner, and author. She frequently writes for Bellespirit magazine. 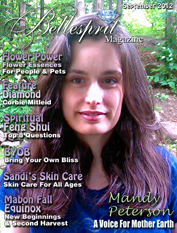 The first time I discovered Mandy was through YouTube, I came across one of her EFT videos and I was hooked! I’ve been watching her channel and reading her blog ever since! I am so grateful that I was able to have her answer a few questions about her truly remarkable gifts. Have you always known you were an Empath and had unique abilities? I was raised in an abusive home, so I admit my “abilities” started out as a form of hyper-vigilance and a self-defense mechanism. Tuning into people was a way to try to stay safe and to predict the moods of those around me. I would try to “feel” for when it was safe to speak or whether I needed to hide, withdraw or shield myself from everything that went on in our household. So, I never thought of it as a gift but something that seemed to make me weaker than others and oversensitive. It wasn’t until I sought healing from a psychic healer that I learned I was a “psychic sponge,” “empath” and an “earth empath.” Earth empathy seems to be another form of empathic “hyper-vigilance” and needing to feel safe or alert to dangers. I now know how to use my empathic ability to help people with their healing, relationships issues, or issues of unrequited love or abuse. I also use it to help people understand how important our connection to Earth is, how energy works and how to recognize when energy is out of balance. Did your empathic healing & psychic abilities naturally guide you to EFT? When did you decide to become an EFT Practitioner? When people originally started approaching me for readings, being referred by friends and others, I was still very shy and I felt unconfident with being able to simply speak to people or to know what to say or how to say it in the right way. I had been exceptionally quiet and shy most my life. So, I decided to take some coaching courses, feeling that maybe this would help me. Looking up courses, I saw one called “Energy Psychotherapy.” I wasn’t expecting it would be all about “meridian tapping.” I thought it would be about using ones empathic ability to read energy. I later felt intrigued to sign up for a course called “Awakening the Light Body.” It, too, was surprisingly about “tapping” on this or that in order to “awaken the light body,” clear the energy field, etc. Despite finishing these courses, I never really used EFT for the longest time (about 3 years). It was hard for me to believe “tapping” on places on the body was something that would really work. Plus, who was I to help anyone when I had problems myself? Then, one day a client that I read for came to me in distress and pain over a love situation and something told me to ask her if she was open to letting me try some EFT. I tapped her remotely and her improvement was so dramatic that it took her completely by surprise and I was quite surprised myself. I continued to experiment and was quite surprised when people responded quickly and dramatically, especially with pain, heartache and energetic issues. In your book “I Am the Lotus, Not the Muddy Pond: Peace through Non-Conformity,” you talk about the Law of Attraction and miracle mindedness. Would you mind sharing a bit about miracle mindedness and how it relates to manifesting? According to my guides, miracle mindedness is the purified state of mind that the masters achieved; such as Buddha and Christ. It has nothing to do with owning or having anything, because in the spiritual dimension there is nothing to own or to have; and most of the rules we go by in the material dimension are fear-based illusions that entrap us into manifesting in predictable ways—ways which ultimately manifest loss, feelings of “not enoughness” and suffering. From a purified state of releasing our egoic attachments rather than encouraging them, we can begin to manifest in service to the spirit and the highest good as opposed to manifesting through needing middle steps, money, to increase our self-worth through external pursuits, etc. If I have lost you here, I probably explain it better within the book. The book “A Course in Miracles” is another reference that attempts to teach us how to achieve this state of mind. In the whole, miracle mindedness allows us to release our obsessions and our desires in order to be one with the Creator in the now, rather than through hoping to attain something in the future. It allows divine recognition of the true miracle which is all around us everywhere at all times. In allowing this divine recognition of the true miracle, it creates a true abundance mind-set; not one based upon how much “success” or physical “wealth” we can attain. In fact, with miracle mindedness there is no success or failure. There is only an abundant respect for life everywhere (in which the Holy Spark is recognized as being one with one’s own). There is a release of the need to keep seeking our self-worth externally and in ways which self-sabotage us in the end. When in collective self-sabotage mode (because most of us feel the need to manifest in similar ways), we end up destroying more in the bigger picture (which is communicated through our environmental issues) rather than respecting and co-creating with it. Miracle mindedness, however, helps us to find our way back to co-creation (and out of this sense of being separated), and to a sense of self-esteem that is dependent upon nothing in form. I am intrigued by your intuitive abilities and all the ways you help others find more love & health in their life. Could you share with us about “Karmic Unweaving” and how you use it to assist your clients? Karmic Unweaving is a term a friend gave to me to use in place of defining what I was doing as ‘using the Law of Attraction backwards.’ Like dream interpretation and problem solving, it uses an outcome that is already in form and moves backwards from this to find what thoughts or beliefs created it. The aim is to reach the thoughts and beliefs that lie beneath our superficial thoughts and beliefs, as well as why we are thinking or believing in them. There are so many “thoughts” and “beliefs” we have that we never think of because we see them as part of being “normal” or being part of our social definitions (such as of “abundance,” “success,” “failure,” etc.). Sometimes, these beliefs are what block a person from a permanent recovery or contentment, because they may heal themselves and then go back into a way of life, relationship or pattern that brought on their pain, anxiety or symptoms. Karmic Unweaving, therefore attempts to “unweave” why some of us may keep backtracking to beliefs that never served us and to understand why. I read your beautifully written story “The White Buffalo Calf Woman and Fukushima.” At one point the White Buffalo Calf Woman talks about the Earth waiting for all of us “to understand who She is and what Her truth is.” In the article you go on to say she tells you to find this truth through prayer and nature. What ways have you found to connect with this truth? Do you feel EFT helps people to open to their connection with God and the Universe? If it is used for this purpose, yes. But I have also seen people lose connection with “God” if they become too focused on outcomes. The symptoms are similar to psychic addiction, in that both have an addiction to outcomes and a need for control. Do you have any suggestions for those who want to use EFT but are not comfortable with “tapping” or familiar with the points? If they know where the chakra points are they can simply tap on their chakras. Otherwise I just recommend circling the heart with the palm of the hand. Clockwise can represent instilling energy while counterclockwise can represent clearing or removing energy. Are there specific things you do each day to find balance and joy? Play with my cats, enjoying nature, writing, meditating. Having a sense of humor helps, too! I can be a really serious person sometimes, but I also like to joke around a lot. Thanks for the wonderful interview, Mandy! For more information about Mandy please visit her site. Please check back for new posts and upcoming interviews! Continue to find new ways to love yourself and keep tapping! Thanks for reading!